The last glacial period is sometimes colloquially referred to as the "last ice age", though this use is incorrect because an ice age is a longer period of cold temperature in which ice sheets cover large parts of the Earth, such as Antarctica. Glacials, on the other hand, refer to colder phases within an ice age that separate interglacials. Thus, the end of the last glacial period is not the end of the last ice age. 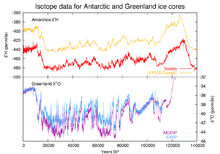 The end of the last glacial period was about 12,500 years ago, while the end of the last ice age may not yet have come: little evidence points to a stop of the glacial-interglacial cycle of the last million years. The last glacial period is the best-known part of the current ice age, and has been intensively studied in North America, northern Eurasia, the Himalaya and other formerly glaciated regions around the world. The glaciations that occurred during this glacial period covered many areas, mainly on the Northern Hemisphere and to a lesser extent on the Southern Hemisphere. They have different names, historically developed and depending on their geographic distributions: Fraser (in the Pacific Cordillera of North America), Pinedale, Wisconsinan or Wisconsin (in central North America), Devensian (in the British Isles), Midlandian (in Ireland), Würm (in the Alps), Merida (in Venezuela), Weichselian (in Scandinavia and Northern Europe), Vistulian (in northern Central Europe), Valdai in Eastern Europe and Zyryanka in Siberia, Llanquihue in Chile, and Otira in New Zealand. Canada was nearly completely covered by ice, as well as the northern part of the USA, both blanketed by the huge Laurentide ice sheet. Alaska remained mostly ice free due to arid climate conditions. Local glaciations existed in the Rocky Mountains, the Cordilleran ice sheet and as ice fields and ice caps in the Sierra Nevada in northern California. In Britain, mainland Europe and northwestern Asia, the Scandinavian ice sheet once again reached the northern parts of the British Isles, Germany, Poland and Russia, extending as far east as the Taimyr Peninsula in western Siberia. Maximum extent of western Siberian glaciation was approximately 18,000 to 17,000 BP and thus later than in Europe (22,000–18,000 BP). Northeastern Siberia was not covered by a continental-scale ice sheet. Instead, large, but restricted, icefield complexes covered mountain ranges within northeast Siberia, including the Kamchatka-Koryak Mountains. The Arctic Ocean between the huge ice sheets of America and Eurasia was not frozen throughout, but like today probably was only covered by relatively thin ice, subject to seasonal changes and riddled with icebergs calving from the surrounding ice sheets. According to the sediment composition retrieved from deep-sea cores there must even have been times of seasonally open waters. Other areas of the Northern Hemisphere did not bear extensive ice sheets but local glaciers in high areas. Parts of Taiwan for example were repeatedly glaciated between 44,250 and 10,680 BP as well as the Japanese Alps. In both areas maximum glacier advance occurred between 60,000 and 30,000 BP. (starting roughly during the Toba catastrophe) To a still lesser extent glaciers existed in Africa, for example in the High Atlas, the mountains of Morocco, the Mount Atakor massif in southern Algeria and several mountains in Ethiopia. In the Southern Hemisphere, an ice cap of several hundred square kilometers was present on the east African mountains in the Kilimanjaro Massif, Mount Kenya and the Ruwenzori Mountains, still bearing remnants of glaciers today.